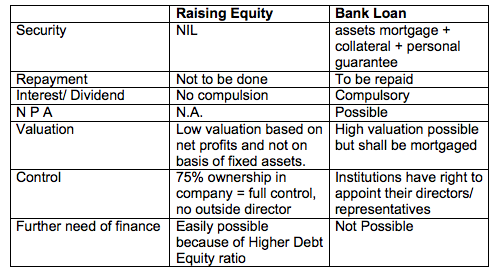 from financial institutions be it Term Loan, Working Capital, Bank Guarantee, Letter of Credit etc. The SME platform is a new exciting platform provided by Bombay Stock Exchange for small and medium sized companies with high growth potential. It is a dedicated stock exchange for the MSME sector which allows the MSME's to access capital markets easily, quickly and at lower costs. This SME platform provides better, focused and cost effective financial service to the MSME sector. The company can raise equity capital easily & in quick time without facing cumbersome compliance procedures . The cost of raising capital & getting listed on the SME exchange is very low . With help of this additional capital, a company can expand operations , repay bank loans and thus blossom into a full fledged corporate entity . Auto migration to the main stock exchange is also possible after 3 years of listing. Distributable profits in past 2 financial years out of 3 years.